With cloud services losing their 24x7 luster, Hyperic is today expected to step up with its second service probing for potential weaknesses. Hyperic plans to announce CloudStatus - Google App Engine, for developers to spot potential problems with Google's hosted service. CloudStatus uses a set of plug ins that tap Google App Engine's DataStore, Memcache and global network connectivity. So far, there have been no reported problems with Google App Engine. The company is also expected to launch a plug-in letting users of its HQ open-source systems management suite monitor their applications on Google App Engine. HQ provides performance tracking, alerts and error diagnosis. You won't be able to make changes to Google App Engine to improve the performance as Google is not opening up its infrastructure. Hyperic has, though, promised you will be able to detect potential problems and plan accordingly. 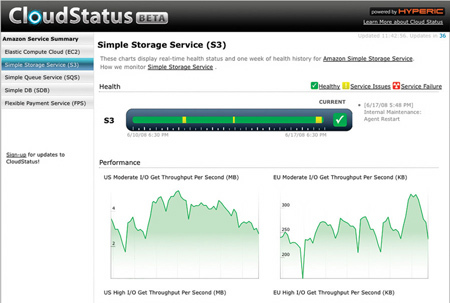 CloudStatus - Google App Engine follows CloudStatus for Amazon's Web Services, which launched in June. Hyperic claimed CloudStatus users got at least a 20 minutes up head that Amazon's S3 service was going down. Hyperic said lack of monitoring, management and service-level agreements (SLAs) are some of the major obstacles to wider use of cloud computing in businesses. The problem is cloud services from companies like Google are not open to general scrutiny, making it harder to tell what's going on or to change things at an infrastructure level. While Hyperic is concerned about the lack of visibility it doesn't believe you need to know every log reading or hardware configuration to manage your applications, just the relevant information. Then you can build SLAs, redundancy policies or fail over plans accordingly. "The reality is you don't need to know everything about it, like the hardware. You just need to know the throughput and latency," said Hyperic senior director of marketing Stacey Schneider. The challenge, though, lies in persuading service providers to open up more of their systems to external management scrutiny and providing the same level of management across different clouds - the Amazon and Google services monitor different parts of the respective clouds.